Built in the late 15th century and greatly renovated and expanded in the mid-17th century, the Franciscan Convent of St. Anthony of Padua was for centuries a religious and cultural landmark in western Spain. It is situated in the village of Garrovillas de Alconétar, in Cáceres province, in the autonomous community of Extremadura. The village is scarcely known today, in spite of its long history and heritage wealth, which incorporates Prehistoric dolmens, Bronze Age archaeological sites, Roman remains and 15-17th century religious and civic buildings. Although it was classified as a Monument of Cultural Interest in 1991, the Convent is now in an advanced state of disrepair. The highlight of the religious complex is the Gothic church, with ribbed vaults, a single nave and a polygonal apse, featuring two Renaissance chapels and two Plateresque style chapels on the sides. The two-floor cloister is built in sober Renaissance style. The Convent of St. Anthony of Padua was established in 1476 through a Papal bull. Numerous Franciscan friars from the Convent went on evangelisation missions to the Americas and the Philippines, taking European culture to other civilizations. The slow degradation of the monument started in 1835, when the Spanish State expelled the Franciscan Order and sold the Convent. In 1883, while searching for allegedly hidden gold, the villagers set the altarpiece on fire, causing extensive damage. Since then, the religious constructions have been used as a fabric factory, a forge, and a barn, among other functions. The site has also suffered acts of pillaging and vandalism. The roofs, domes and walls are at serious risk of collapse, while the remaining mural paintings are doomed to disappear within a few years. The Convent is full of rubbish and debris and in need of urgent action to avoid its total loss. 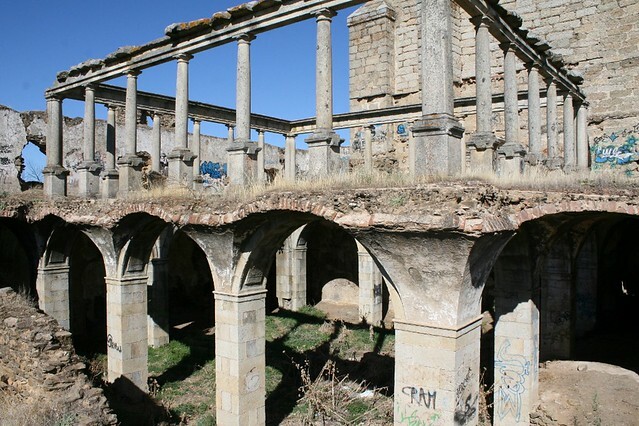 Hispania Nostra has undertaken various initiatives to save the site, which is owned by the Regional Government of Extremadura and private owners, and submitted the nomination for ‘The 7 Most Endangered’ programme 2016. With the support of local organisations, the University of Extremadura and the Town Council of Garrovillas de Alconétar, the nominator proposes an emergency intervention programme based on volunteer work managed and supervised by experienced professionals. The local community will contribute with construction materials, equipment and staff, and host the volunteers. A detailed plan has already been formulated and agreed by the relevant authorities and the programme could start in spring 2016, provided that the status of public property is given to the Convent. With this proposal, Hispania Nostra aims not only to mobilise the public authorities at various levels of governance to carry out the complete rehabilitation of the monument, but also to set an example for similar cases throughout the country, particularly important in these times of economic crisis.